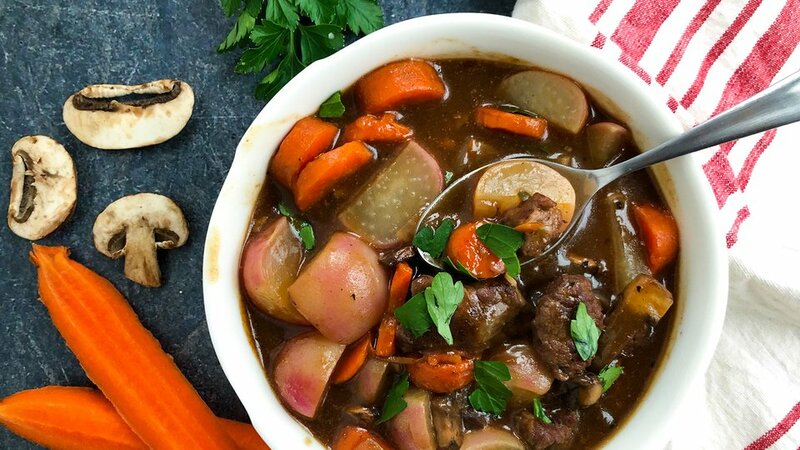 This beef stew may take a little longer to cook, but trust me when I say it's so worth it! It's like, sneak-to-the-fridge-in-the-middle-of-the-night good. Not to mention, it's full or veggies and protein while still managing to be low in carbs. Heat oil over medium-high heat in a large pot. Add beef and sear until browned on all sides. Set aside on a plate. Add onions, mushrooms, and garlic, cooking until onions are tender. Sprinkle with flour and stir to coat evenly. Add red wine and scrape the bottom of the pot to remove any browned bits. Add back beef, along with beef broth and spices, then simmer (covered) over medium-low heat for 60-70 minutes until beef is tender. Add radishes and carrots, then simmer for another 30-40 minutes, until veggies are tender. Serve hot or let cool and divide between meal prep containers to enjoy the rest of the week. Will keep in the fridge up to one week, or in the freezer up to one month.